According to a recent study conducted by the National Home Builders Association, more than 80% of new home buyers start the home buying process on the Internet. It seems that those statistics have yet to reach the advertising and marketing departments for a majority of the home building industry. See also, Home Builders Are You Blogging? One Texas home builder however, seems to be getting the message loud and clear. Tilson Homes has been building quality new homes on Texas land for over 75 years, and a quick peak at their website might foretell why many more prospective clients will consider them to build their new house in the future. 1. The main objective for most house hunters searching the Internet is to gather information that will help them make an informed buying decision. An online sales counselor should be available 7 days a week during normal business hours to help answer prospective questions that are not covered in your online marketing literature. 2. Customer interactivity does not have to be flashy to be an effective Internet advertising tool on home builders websites. The ability to create a user account to store home search information will foster repeat visits to your website, and begins to incorporate a sense of customer attentiveness to your prospect’s personal needs and wants. 3. It is suggested to formulate multiple access points for the main content of your website. Web marketing studies show that different web users respond to different visual stimuli. Balancing graphic links with keyword rich text links can increase your website browsers ability to effectively navigate your floor plans and home offerings easier. 4. A common complaint for many home builder websites is that there is not enough information regarding specific product and floor plan offerings. Stop all heavy handed advertising techniques that impede a home buyers ability to gather information! 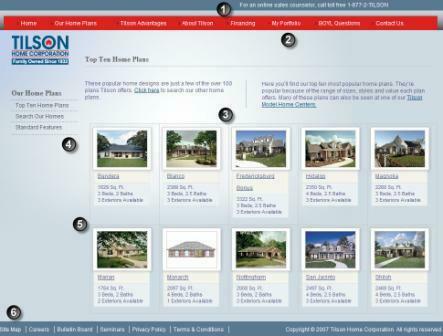 Give them what they are coming to your website for new home information. 5. Provide live pictures that actually demonstrate the product that you are offering to build. A home builder only has to build a floor plan for client, to be able to re-use those images to sell to another. Most home buyers don’t want to imagine their future home, they want to see it. Create a simple keyword rich, text-based site map navigation page that allows browsers un-tethered access to everything that your home building website offers. This is the information age. Gone are the days of home builders and real estate professionals being the only segment of the population to posses knowledge regarding new housing and construction. Just as the home building industry has implemented new technology, and techniques to speed up the construction process itself, the online home buyer has also discovered the power and freedom that well designed web technology brings. Builders who take initiative with these simple, yet effective website marketing strategies will reap the rewards that transcend their core construction services, they will be sewing the seeds of future new home sales.